Mathematical models have been developed for the calculation of measurement errors of the coefficients of the heat conductivity and thermal diffusivity of thermal insulating materials. 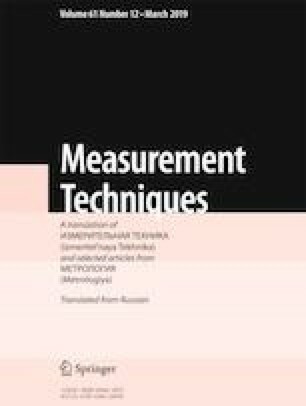 A technique for selection of the following optimal parameters was created, based on models: duration of the heat pulse and the chief structural dimensions of the measuring device. Optimal conditions for applying the algorithm for processing the experimental data were also defined. Translated from Izmeritel’naya Tekhnika, No. 12, pp. 43–46, December, 2018. This work was performed with the support of the Ministry of Education and Science of Russia within Agreement No. 14.577.21.0214 (PNIER RFMEFI57716X0214).